Book Services Ads in Indian Newspapers Instantly Online! Why Book Services Ad in Newspapers? 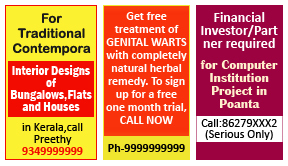 Run on line Service ads are very common across all newspapers in India. Services offered and required can be for any and all day-to-day needs like Travel, Catering, Governess, Insurance Agents etc. ReleaseMyAd is always more than happy to offer our services to make your Service Classified Text Ad better and catchier. Classified Display (CD) advertisements hold a lot of potential for creativity and beatification as they comprise of elaborate visual enhancements. Service display classifieds are one of the most creative categorical ads as they attract a lot of attention of the readers. Service CD advertisements need to be and must reach out to the specific audiences, ReleaseMyAd is here to help you with that. 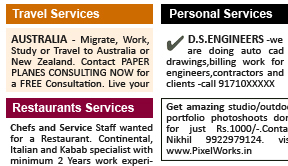 How to Book Services Advertisement In Newspapers? The first step comprises of choosing the ad type as classified text ad and then going on to the page where you can choose your category as Services, from where you proceed towards composing your ad. You can also choose from a wide range of specific sub categories such as Gym/Aerobics Instructor, Translators, Travel Guides, Food & Nutrition Consultants and more, in order to place your ad under the most appropriate heading. In the second step you can compose your ad from scratch by typing your ad in the box and then adding background colors or screen borders and underline to make it distinct and explicit. Do not miss out on getting a look at your ad before publishing it with our exclusive Live Preview Ad Feature. The third and the last step needs you to confirm your release dates and get your payments cleared in order to receive an email confirmation from our side with all your booking details. Composing your newspaper ad begins with selecting your ad type as Classified Display which lands you on the page where you can choose the category as Services and move towards composing & designing your ad on the ‘Compose Ad’ page. On the ‘Compose Ad’ page you can begin by either selecting our pre designed templates or simply uploading your own personally designed display classified advert. When you choose one of our pre designed templates, you can not only change the background colors of your ad but also the font, font size and upload images. The best part of releaseMyAd.com is our Live Ad Preview Feature, with which you can see how your ad will appear in a newspaper. As part of the checkout part you are required to confirm your release dates to receive an email confirmation with all your booking details. Please make sure that you clear all your payments too at least before 2-3 days of your release dates. You can make your payments via Debit/Credit Card or Net Banking (Online Payment) or pay via Demand Drafts/Cheques or get your Cash Collected from your doorstep (Offline Payment Mediums). Q. We are one of the leading Packers & Movers and our H.O is at Vizag. We want to give Ad in the Classifieds page. Can you give us the details reg the Package's. Otherwise you send your representative to our Office.